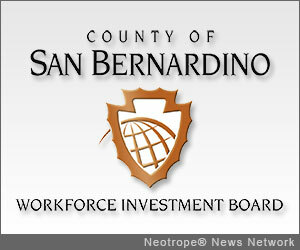 SAN BERNARDINO, Calif. /California Newswire/ — Leveraging the Workforce Investment Board of San Bernardino County's On-the-Job Training program, the Hi-Desert Medical Center has recently added 6 full-time registered nurses and saved $25,000 in hiring and training costs. Once challenged by the economy, the Hi-Desert Medical Center is now flourishing with help from the Workforce Investment Board. The company has used the Workforce Investment Board's business services to maintain their 600 person staff in the past, and recognized that the On-the-Job Training would make it possible to achieve their staffing goals. The Workforce Investment Board offered the Hi-Desert Medical Center a number of services including recruitment assistance, job advertisement, On-the-Job Training and strategic planning. Offered at no cost to the employer, these programs reduced hiring costs and increased productivity. "When we learned about the On-the-Job Training program, it sounded too good to be true," said Lionel Chadwick, Chief Executive Officer for Hi-Desert Medical Center. "The financial and professional support provided by the Workforce Investment Board's program reduced our expense, limited our risk, and helped us recruit excellent employees at no cost to us. It was the answer to our growing pains." The On-the-Job Training program reimbursed the Hi-Desert Medical Center for a portion of a new hire's wages during the initial training period. Now fully trained and having completed the probationary period, all six employees have been permanently hired on full-time at $28.04 per hour. "Hi-Desert Medical Center is a perfect example of how the Workforce Investment Board programs assist employers," stated Sandy Harmsen, Executive Director of the Workforce Investment Board. "On-the-Job training bridges the gap for a business that needs to expand their workforce." The Workforce Investment Board also offers many free services and programs to local businesses through its Business Resource Team. The Business Resource team assists local companies with services such as layoff aversion programs and process improvement services that save and create jobs. Additionally the Business Resource Team provides business workshops, access to the On-the-Job Training program and assistance matching finding job seekers with the skills employers are seeking. In 2011, the Workforce Investment Board trained more than 3,300 job seekers to enter careers in high-demand industry sectors the Business Resource Team visited and established relationships with more than 2,800 local businesses. "The County of San Bernardino Workforce Investment Board is helping the county to create a vibrant economy with a skilled workforce," said James Ramos, Third District Supervisor. "We are proud of their efforts." For information on upcoming WIB training classes and programs, contact the local Employment Resource Center or call (800) 451-JOBS; visit www.csb-win.org . Hi-Desert Memorial Health Care District distinguishes itself as the leader for healthcare services of the Morongo Basin. A modern, nonprofit 59-bed acute primary care hospital is located on the principal campus of the Hi-Desert Medical Center. Services include a wide range of quality inpatient and outpatient diagnostic, treatment and rehabilitation services, home health and hospice services, and a variety of community outreach services. Hi-Desert Medical Center has more than 90 physicians in 25 medical specialties and over 600 employees. Licensed by the State of California and fully accredited by the Joint Commission on Accreditation of Health Care Organizations and the California Medical Association, the hospital holds membership in the California Healthcare Association and the Hospital Council of Southern California. For more information, visit the Hi-Desert Medical Center at http://www.hdmc.org/ . Employers and job seekers who are interested in the Workforce Investment Board programs may call: (800) 451-JOBS or visit www.csb-win.org. Also follow us on Twitter @InlandEmpireJob – and YouTube http://www.youtube.com/SBCountyWIB .